It's freezing here. Every morning....most mornings I have to get up and thaw the ice off our car so I can take baby boy to school. Cold juice and milk have turned to warm tea or milk or hot cocoa for the kids. 1. Do you prefer Cider or Cocoa? 2. Do you make any special drink this time of year for your family? 2. In my country we make a special drink called Sorrel. You can find the recipe here if you like. Red beans and rice it is! that looks like a really good dinner. And I happen to love your blog name. Cute title and perfect fit. i do love a nice mug of hot chocolate though! we are making that for dinner tonight! 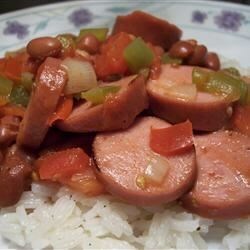 LOVE red beans and rice! Is that Andouille sausage? YUM! And that Sorrel would wash it all down wonderfully. Good Lord, I am so hungry. Why did I skip breakfast during our Friday Food Fight? Definitely like cocoa the best, but both are great. I also love egg nog this time of year! If I can do either sugar-free- I'm in. I love cider. Mulled cider is a family tradition, but I also LOVE starbuck's Caramel Apple Cider! It has to be Cocoa for me. Cider gives me heartburn. I am following you back!! I hope you have a wonderful Friday!! I prefer cocoa and the only special drinks we make are for adults. Can I come to your house for dinner? Looks yummy!! The kids prefer cocoa, Roy likes cocoa with peppermint, I'll take cocoa, wassle, cider, or whatever the flavor of the night is. I prefer cocoa, haven't had it in forever though. Its warm here, no need... No, we don't have any special drinks. I like them both, but I think I prefer good cider. My kids love rich and creamy cocoa made from scratch. I'm not picky.. I like cocoa or cider... but I really prefer chai. ;-) Any warm drink this time of year is good. I like cider, but cocoa too. Mostly I drink coffee though. I make cocoa with marshmellows for the kids. Sorry I'm so late in visiting you, but the internet is acting up, and it's very frustrating. I prefer cider over cocoa, since I can't take too much caffeine. We don't make any special drink.. I cocoa much better, and the family only have it once in a great while. Thanks for the reminder, I will pull it out for Christmas. And yes, I have been freezing too!